Get you ‘elf on’ and join us for some festive treats and meet others passionate about abolishing slavery in Wales. Get baking red cakes, handing out red sweets, wearing red, whatever creative idea you can think of, so that we can raise awareness about the 46 million modern day slaves in our world. 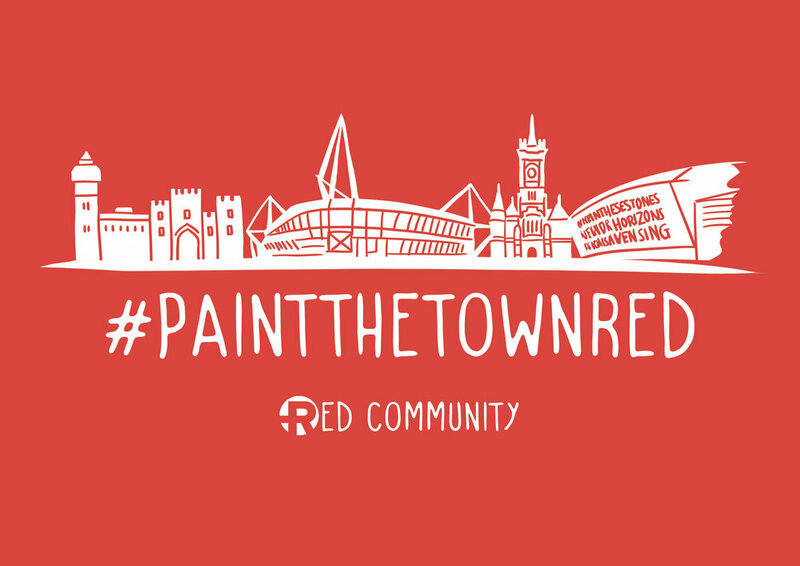 Then share what you're up to on social media using our # #paintthetownred and join us to celebrate in the evening, as we join with our friends at Manumit http://manumitcoffee.co.uk/ to showcase our Sack Slavery art projects. Details to follow! You are warmly invited to join us for the Arise Conference that is taking place in Cardiff on Saturday 13th October in Cardiff. 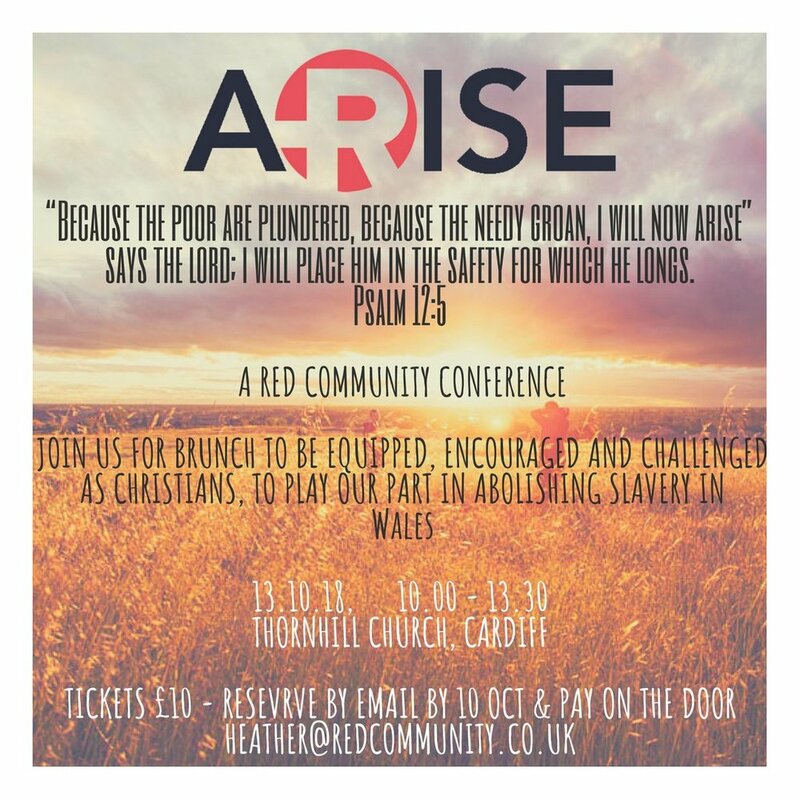 Arise will feature a host of speakers and contributors who are involved in various frontline ministries and initiatives to tackle human trafficking and modern slavery here in South Wales. Our hope and prayer is that all those delegates who attend will leave Arisehaving been inspired by the charge of God's Word and the testimony of God's people to step up, press in and play their part in the fight for freedom, wherever they're are based. Red Sessions are back! An evening to gather together to catch up on what's been happening, eat yummy cake, grab a drink and look ahead to how together we can play our part in abolishing slavery here in Wales! On Saturday 25th November we were excited to be hosting Red Christmas - an evening of live music, craft, scummy cakes and festive fun. The purpose of the evening is to raise much needed funds for our Embrace project and also raise awareness about modern slavery. 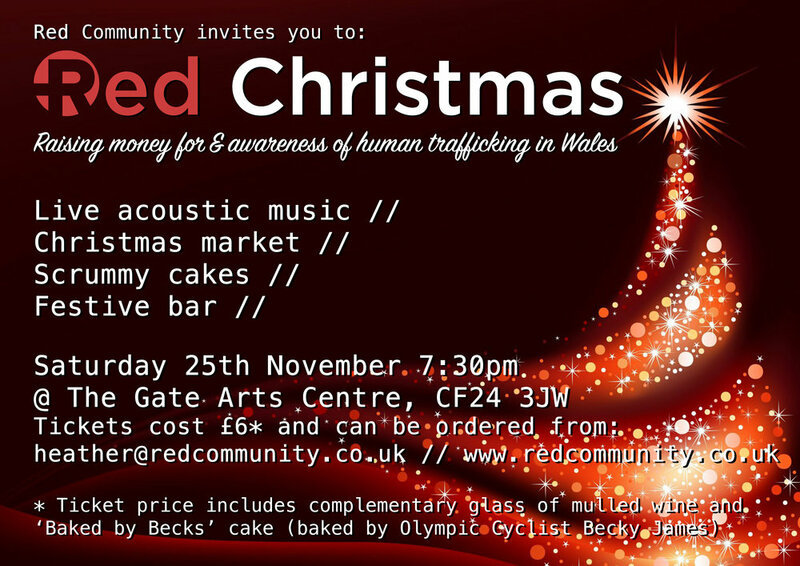 Red Christmas will be held at The Gate Arts Centre in Cardiff (CF24 3JW) and starts at 7:30pm. Tickets cost £6 (which includes a glass of Mulled wine and a ‘Baked by Becks’ cake - baked by former Olympic cyclist, Becky James). Manumit Coffee will also be served that evening. To confirm your place or for more information, please email heather@redcommunity.co.uk. On Thursday 5th July we are excited to be partnering with Safe From Slavery to host Invisible Chains - a hard-hitting dramatic event that will confront you with the reality of human trafficking like no other event ever could. The event will held at Bethel Church, Newport, and will involve drama, sung worship and a hard-hitting message. Be great to see you there! Join Dai Hankey at Swansea's Square Peg Coffee House as he delivers a 'Peg Talk' - exposing the brutal reality of human trafficking and modern slavery, highlighting what is happening both locally and globally, discovering what God has to say about it and exploring ways of getting meaningfully involved in the fight for freedom. Join the Red Community team at Minster Christian Centre for an inspiring evening of challenge, prayer and praise as we consider the reality of human trafficking and modern slavery today. We will highlight what is happening both locally and globally, discover what God has to say about it and explore ways of getting meaningfully involved in the fight for freedom. Entry will be free and refreshments provided. Join the Red Community team at City Church, Cardiff for an inspiring evening of challenge, prayer and praise as we consider the reality of human trafficking and modern slavery today. We will highlight what is happening both locally and globally, discover what God has to say about it and explore ways of getting meaningfully involved in the fight for freedom. Join the Red Community team at Cornerstone Evangelical Church for an inspiring evening of challenge, prayer and praise as we consider the reality of human trafficking and modern slavery today. We will highlight what is happening both locally and globally, discover what God has to say about it and explore ways of getting meaningfully involved in the fight for freedom. Join the Red Community team at Rhiwbina Baptist Church for an inspiring evening of challenge, prayer and praise as we consider the reality of human trafficking and modern slavery today. We will highlight what is happening both locally and globally, discover what God has to say about it and explore ways of getting meaningfully involved in the fight for freedom. This training session for the first draft of Embrace befrienders will be delivered by members of the Red Community team alongside our partner agencies. The training is free, lunch and refreshments will be provided. Join us in Cardiff on Saturday 15th October for Freedom Day. First up we will participating in the A21 Walk for Freedom, meeting 10am at the Wales Millennium Centre. You can register for the walk here. Following the walk we are excited to have booked the iconic Pierhead building for the Freedom Event that will include drama, story, songs and prayer, both inside and outside the building, to raise awareness about human trafficking and modern slavery in Wales. The street drama will take place at 1pm. The indoor event will start at 2pm. It'd be great if you could join us for the day. Join our team of 2-wheeled freedom fighters for 4 days of adventure this summer as we cycle the length of Wales to raise awareness of human trafficking whilst simultaneously raising money for 2 incredible frontline justice ministries: IJM and AIM. We are looking to build a team of 20 riders who are each committed to raising a minimum of £500 in sponsorship, covering all their own costs (including food and 1 night's accommodation at £20) and engaging in awareness-raising evenings at each of the destinations (except 1). If we pull this off it will guarantee a minimum of £10,000 raised for IJM and AIM and also help to shine a light on human trafficking and modern slavery right across Wales. If you'd like to sponsor the team and make a donation, you can do so here. Calling all abolitionists, teachers, lecturers, students, youth workers and pastors! Join us on Thursday 10th March for the South Wales launch of Red Alert. Red Alert is DVD resource that includes a suite of films that have been created to raise awareness about human trafficking and modern slavery in Wales. Made with money from Gwent Police it is our intention to make sure that every school, college and youth group in Wales get the opportunity to use Red Alert to help educate young people about the reality of modern slavery and how they can join the resistance. Copies of the DVD will be available on the night. Join us on Tuesday 23rd February as Dai Hankey (Red Community) and Andy Toovey (TorFilm) introduce Red Alert. Red Alert is DVD resource that includes a suite of films that have been created to raise awareness about human trafficking and modern slavery in Wales. 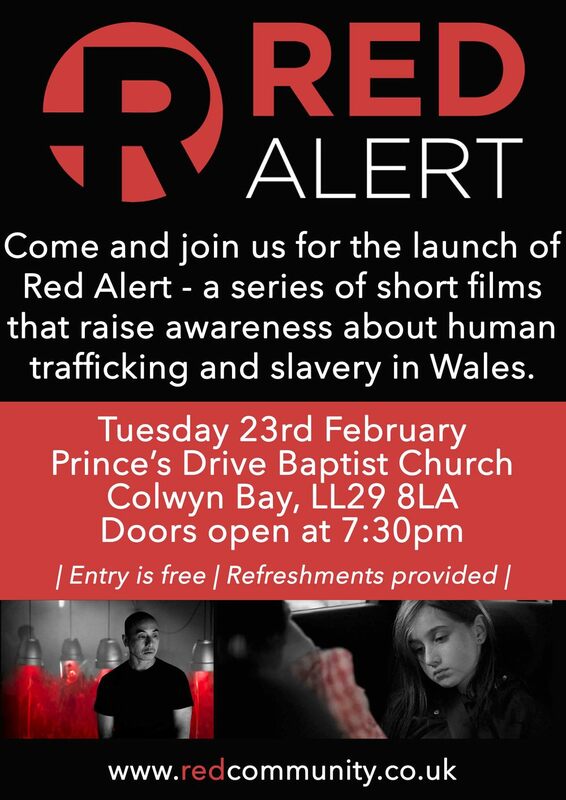 Made with money from Gwent Police it is our intention to make sure that every school, college and youth group in Wales get the opportunity to use Red Alert to help educate young people about the reality of modern slavery and how they can join the resistance. Redemption Sessions are all about raising awareness, facilitating prayer and growing support for the victims of human trafficking. Session swill be held at Rainbow of Hope Centre, Broadway, Cardiff.